I’m not sure what’s going on here, so I’m definitely going to be reading the story closely. 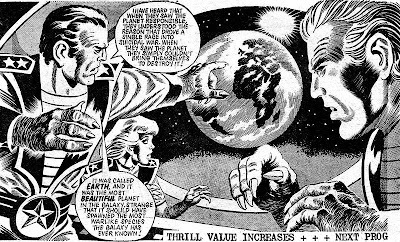 I’m not sure whose art this is – it looks a little like a Bolland, but there’s no signature. When will the credits start? With the Nazis hot on their trail after the liberation of Glasgow, Savage has taken refuge in the highlands. Sadly, the highlands just aren’t high enough to get away from the Volgan air force! Save comes up with a daring scheme – using himself as bait, he runs out into the open, sure that the Volg jet will follow him right into some power lines! Then it’s just a matter of fleeing into the woods while a couple of random soldiers sacrifice their lives to delay the Volg troops. That’s it. Yeah, not much happened this week. In a hundred years, Kennedy airport will have kept its name, although now they call it a spaceport. 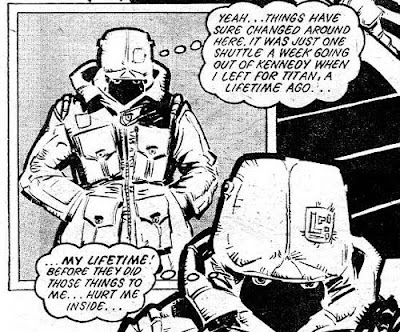 Arriving at that spaceport is a mysterious man in a coat and hat neatly obscuring his face. We don’t need that to recognize him, though, since he’s happy to narrate all about himself for our benefit. The mystery man (Rico) heads over to a vid-phone terminal and calls justice central. 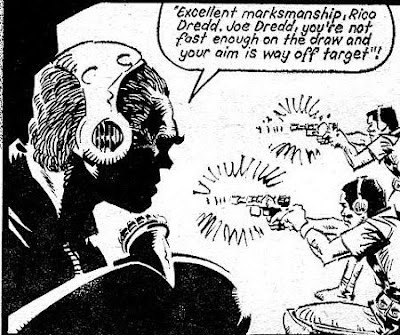 He’s got a message for Judge Dredd. From Judge Dredd! 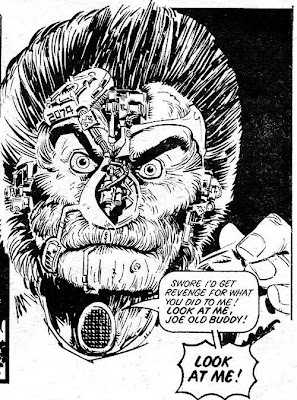 That's right, it’s Dredd’s long-lost brother, Rico Dredd! 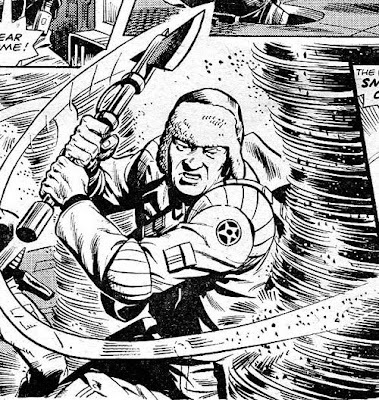 Dredd gets the news while he’s blasting apart a couple of hoods, and leaves the scene the second the survivors have surrendered. He rushes home, knowing that Rico will be looking to settle their old score. He’s in for a surprise when he arrives, though. Rico has rigged the environmental controls so that it’s freezing cold inside, with almost no oxygen! With Dredd on the floor, gasping for air, Rico decides it’s time for a flashback! Yup, Rico had the potential to be the greatest Judge of all time, but then he had to go and throw it away, taking bribes and running a protection racket! And even though is brother Joe owed him everything, Joe turned him in. Which led to Rico being sent to a mining colony on Titan for twenty years! In order to work there comfortably he turned into a monstrous cyborg! 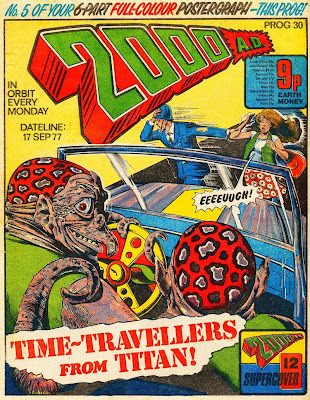 Interestingly the predictions of 2000AD were a little off here. Not that it would be possible to physically alter someone so that they can work in a vacuum, but rather that Titan is a vacuum environment at all! In fact, Titan is one of the most earth-like objects in the solar system, with oceans, seasons, rain and the like. The atmosphere is mostly nitrogen, but hey, at least it’s there. Then things wrap up with the chief judge opining about the peculiarity of it all. Joe and Rico weren’t normal twins, you see – they’re clones of the same person, genetically identical in every way. So how did one end up so bad, and the other so good? The Russians are here! They’ve used lassos to tame the mighty beast, succeeding where the Americans had failed. While the struggle dies down, the KGB boss walks over to Jake and begins to gloat. It seems that the Russians don’t know what’s in the bear – they just know the Americans want it very badly, so they came after it as well. Perhaps the Federal Government putting an open and public bounty out on a specific bear wasn’t the greatest plan. Shako is hoisted onto the nearby Russian ship, and the KGB make their departure, leaving Jake, Buck, and redshirt alive. Things are looking grim for the old yogi – or they were, until one of the Russians, ‘Sergei’, proves almost unbelievably stupid. It seems that he’s frustrated that he was unable to kill an American on the trip, so he’s going to salve his bloodlust by killing an American bear with his bare hands! It goes exactly as well as you’d think it would. Sergei and another soldier are torn apart, and now Shako is loose on the Russian ship – who knows what mischief he can get into now! This week Dan finds himself up against the most preposterous threat yet – the planet of the killer sentient dust devils! Searching for a missing colony-ship, they find they earth-like planet that the settlers had planned to make their home. Once they hit ground they’re attacked by the preposterous foes I mentioned earlier. After retreating back to their small landing craft Dan and company find themselves attacked by the ground itself – it seems the entire surface of the planet is a giant silicon-based life form. Which is a great twist for two reasons. 1: I haven’t seen it before. 2: It leads to this picture, of a Russian man fighting wind and sand with an axe. They burst open the ship’s water tanks, turning the sand into muck for just long enough to call another ship down. Another mystery has been solved, and another death-planet identified. The Lost Worlds are getting found at a respectably speedy pace. I don’t know what I was expecting from that Supercover, but a story about penal reform in the distant future wasn’t anywhere on my radar. Good work, Tharg. 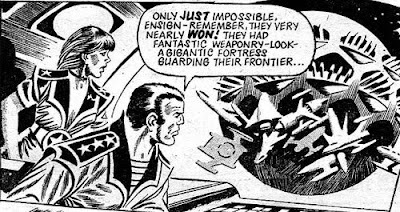 Apparently someone at 2000AD didn’t think MACH 1 was sci-fi enough, because this week he’s chasing down a UFO! It’s shot down on the opening page, and then quickly found by a local kid named ‘Simon’. No one believes him about the spaceship, and he’s viciously abused by his father for ‘telling tales’. Probe even doesn’t show up until the third page, which has to be some kind of a record for this strip. He goes undercover as a lumberjack, hoping to draw no suspicions to his investigation. I guess they want to keep the whole ‘UFO’ thing under wraps. When he brings up the subject at dinner Simon tries to mention his knowledge, but just winds up with another beating for his trouble. 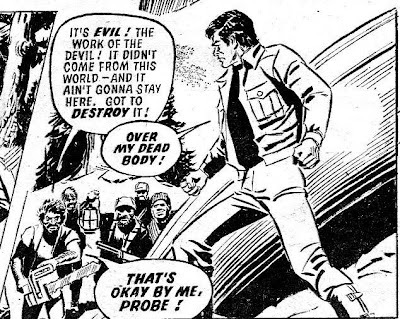 He can’t stay quiet forever, though, and when Probe saves Simon’s life from a falling tree the next day, he feels sufficiently indebted to Probe to lead him to the UFO. Unfortunately Probe was followed from the camp by all of the lumberjacks, and while he tries to figure out how to open the featureless metal saucer, they manage to sneak up on him! So, here’s the big question – will it actually be aliens, or some kind of a hoax? I’m going to be optimistic and bet on aliens. 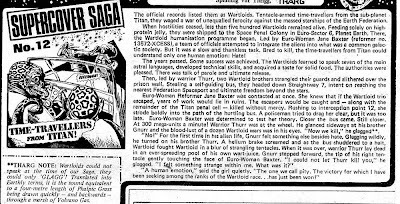 It’s the distant future, and a group of spacemen are closing in on the home planet of a mysterious race who tried to take over the galaxy, and was destroyed in the attempt. Now all that’s left, many years later, are memories, and the death star guarding their solar system. Seriously, a Death Star. As a new feature here in the reviews, I’m going to let you guess what the twist ending is, because between the synopsis I’ve offered and that illustration, you should have enough information to figure it out. So don’t scroll down to the next image until you’ve finalized your guess. As we learned from Futurama and Planet of the Apes, the twist is always ‘turns out it’s man’ or ‘turns out it’s earth’. Hell, this is two Future Shocks in a row where where it 'turns out it's earth'. 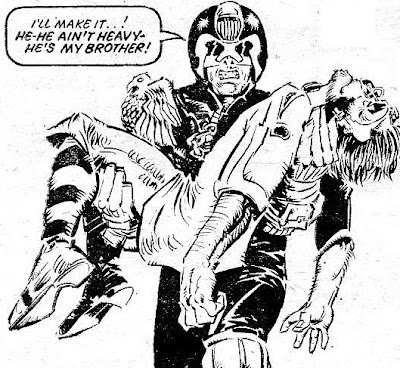 Best Story: Judge Dredd – No contest here. Dredd gets some backstory and character development, we find out he’s a clone, the world of Mega-City 1 grows. Other than that horrible joke, this story’s a classic. Worst Story: Invasion – Nothing happened this week. Seriously nothing.